Text: Outer Limits, opening narration. Pics: “Luminant Point Arrays is a photographic series of old tube televisions taken at the very moment they are switched off. The TV picture breaks down and is abstracted to its essential element: light. This abstraction also results in the collapse of the external reference. Each of these photographs is from a different TV, but it’s also the length of exposure, timing, and time the TV has been running before the photo is taken that affects the results.” – Stephen Tillmans, Leuchtpunktordnungen. “A ruined structure may be nothing more than a structure that has fallen into ruins; a Ruin is a ruined structure that has been contemplated. Ruined structures have been noticed for millennia, often as signs of humanity’s decay from the time of the gods, when there were giants in the earth: but as sacred drama, not the passage-work of history. Focused contemplation of the ruin qua Ruin as a creative dynamic – where the contemplator of a Ruin not only enjoys an ironic/elegiac perception of the inevitability of the passage of past glories, but refigures that perception into a vision of his own world transformed into Ruins as contemplated by a future observer – seems not to have become a recognized topos until the eighteenth century, either as part of the conventional rhetoric attending the Grand Tour, or as a literary device. Neither a transformation from the soap operas of sacred drama to historical perspective, nor the consequent awareness that we live in some future mortal’s past, was likely to have become commonplace until antiquity had been both domesticated and dramatized through the new historiography of writers like Edward Gibbon (1737-1794), whose immensely detailed, secular History of the Decline and Fall of the Roman Empire (1766-1788 6vols) demonstrated to civilized Western Europeans that the story of the ruin and revival of the ancient world was a take both exemplary and continuous with the present. 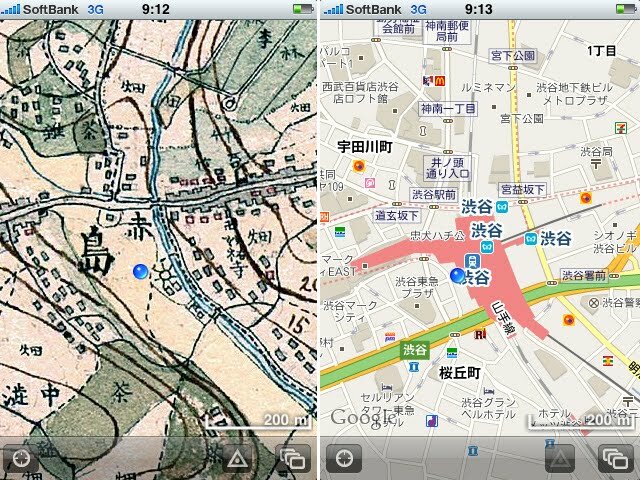 The perspectives that Gibbon brought into focus for the West – en passant making Ruins contemplatable as both Icon and lesson – made the past storyable. Reflecting that such had once been the activity of the [Ruins] I was then contemplating, who knows, said I, but such may one day be the abandonment of our countries? Who knows if on the banks of the Seine, the Thames, the Zuyder-Zee, where now, in the tumult of so many enjoyments, the heart and the eye suffice not for the multitude of sensations, – who knows if some traveller, like myself, shall not one day sit on their silent ruins, and weep in solitude over the ashes of their inhabitants, and the memory of their former greatness. Text: Theme: Ruins And Futurity, The Encyclopaedia of Science Fiction. Image: River of Junk surrounds, Adventure Time Wiki. 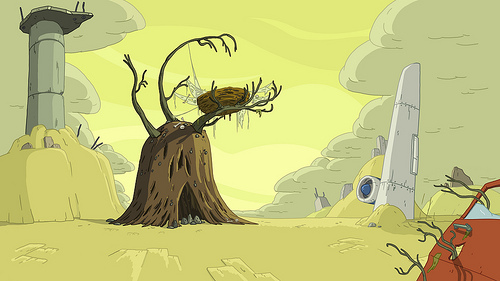 Adventure Time Theme Song: An opening shot showing various weapons and technological debris, including grayed land and undetonated nuclear missiles lying around, and an arm reaching upward from a tree trunk. There also appears to be the remains of a tank’s tread in the center of the shot and a pink necklace and headphones. The bashed up television is another remnant. In the “Animated Short“, Pen’s (Finn) mind is transported back in time to Mars. The world is shown full unlike the world shown above. “Tree Trunks“: Traffic signs, which have since somehow mutated into Sign Zombies. It is unknown how this has happened. The painting in Tree Trunks’ house looks like it could be Egypt due to the triangular structures it shows that may be pyramids. “The Enchiridion“: When Finn and Jake first walk through the forest of Mount Cragdor, pieces of metal and some dryers/washers can be seen as they look for the sacred book. Some of the pieces at the top, right corner of the path may be sinks. “Business Time“: Ancient artifacts frozen in icebergs, including computers, a bike, baby shoes and the Businessmen. When the Businessmen try to remember where they came from, they seem to be in pain. Finn also uses a flamethrower built from two fuel tanks connected to a rifle by a tube. When the Businessmen, along with Finn and Jake, are shot up into the sky, they fall back down revealing the entire Land of Ooo. Ooo seems to be a large island, with open ocean surrounding it. “My Two Favorite People“: When Finn and Lady Raincorn confront Jake and Tiffany, the bottoms of upturned cars can be seen in the ground. Jake also uses a military issue phone and headset, and some mutated and regular skulls can be seen near the fire pit where Jake, Lady Rainicorn, and Finn are sitting. “The Witch’s Garden“: The remains of a highway system and a plane’s wing can be seen near Gary’s nest; the River of Junk is essentially a river of mundane pre-war artifacts. Near the River of Junk, a car door can also be spotted close by. Text: Adventure Time Wiki “Mushroom War”. 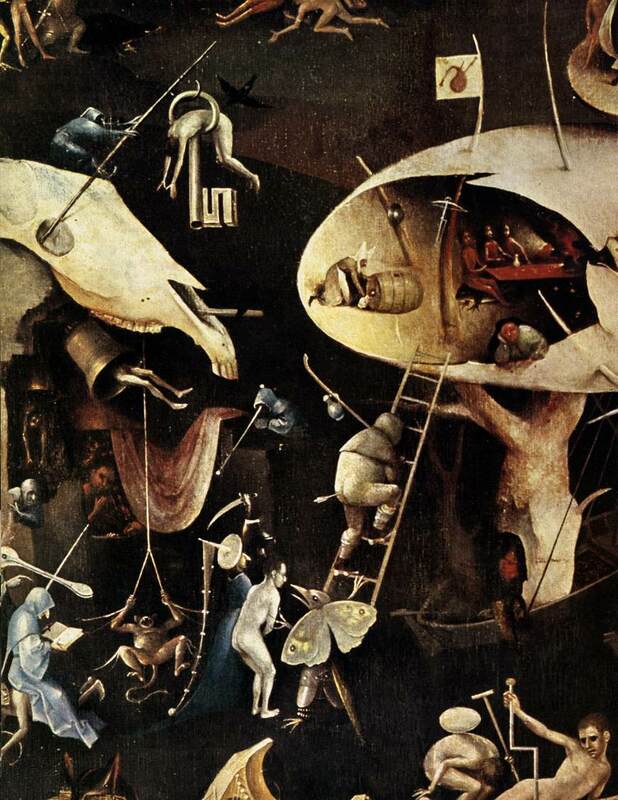 Image: Hieronymus Bosch. The Garden of Earthly Delights [detail]. Oil on panel triptych, 220×389 cm. Collection: Museo del Prado, Madrid. “On the edge of Teletubbyland stands a tall metal windmill, which periodically begins to turn and broadcasts short sequences of actuality film showing children playing together, running on the beach, splashing in puddles or baking cakes, and so on. These sequences are beamed onto the stomach of one of the Teletubbies, who each has a silvery patch there in the shape of a television screen. The Teletubbies look forward to these broadcasts and react to them with pleasure, demanding once they finish that they be played ‘again, again’, as they usually are, in a slightly truncated form. Aside from this, the Teletubbies gambol in their pastoral surroundings, play with objects, dance, sing, and take their meals of TubbyToast and TubbyCustard inside the technological space of the Tubbytronic Superdome, where Noo-Noo, their robotic cleaning machine, sweeps up after them. At intervals, props appear in Teletubbyland for them to encounter, animated clouds, rain or creatures appear, and lengthy animated sequences bring, for example, three ocean liners sailing into Teletubbyland on a miraculous flood, or animals walking two-by-two across the landscape. Jonathan Bignell, “Familiar Aliens: Teletubbies and Post Modern Childhood”, Screen 46:3 Autumn 2005, 373-4. 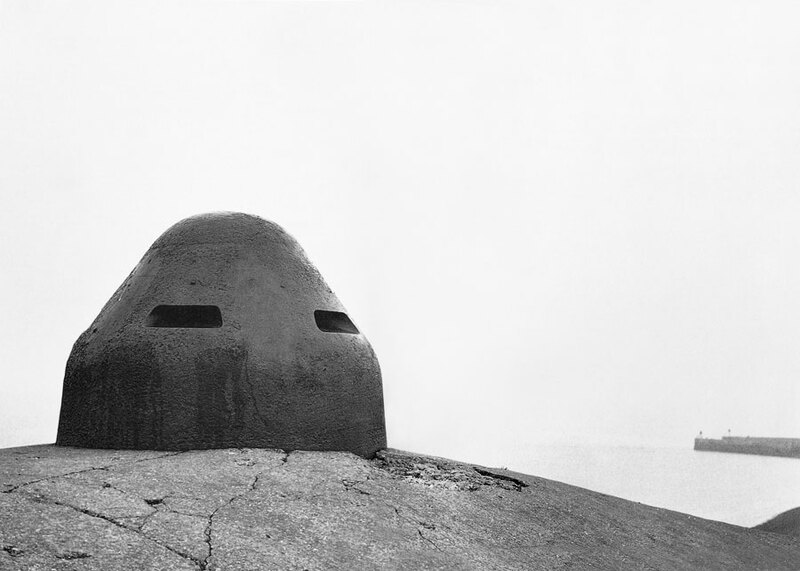 Image: Paul Virilio, Bunker Archaeology.